Understandably, one of the greatest concerns of brides getting married overseas is how they can safely transport their wedding dress. 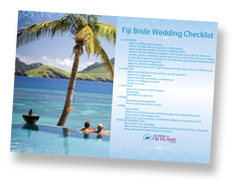 Rest assured, we organise dozens of Fiji weddings every year and not once has a wedding dress gone missing! Most brides want to keep their dress close by at all times and elect to bring it on the plane with them as carry-on luggage. This minimises the chances of it getting lost or damaged in transit. Arrive early as the check-in staff may ask you to open and unpack the dress for security screening. You will need extra time to repack the dress correctly for the flight. Adding an additional 30 minutes to your standard check-in time is advisable. Some airlines do supply closets where wedding gowns can be hung so it’s worth calling your airline ahead to reserve the space. If closets are not available on your flight, pack the dress inside a sturdy travel garment bag and then pack it inside a hard-sided suitcase in the largest size allowed as carry-on luggage. Be aware that this may limit any additional carry-on luggage allowed. When you arrive with your dress (or when your dress gets to you), be sure to put it on a padded hanger right away. may find that many of the folds will come right out, but chances are the gown will probably need to be steamed a little. “Even if the dress has stayed in one spot, hanging in a closet for a week or two, you should still give it one last steaming before the ceremony so it will look fresh,” says Steven Saidman, president of Imperial Gown Preservation and Restoration in Fairfax, Virginia. Professional steaming will produce the best results; usually, the bridal salon where you purchased your gown or the place that did your alterations will provide this service. But if you’ve traveled, this likely isn’t a viable option. A good alternative is to create your own steam room. Cover a bathroom floor with towels and run a very hot shower, allowing the room to fill with steam. Turn the water off, then hang the dress on the back of the bathroom door. Next, wrap your arm in a dry, white towel and run it down the length of the gown, smoothing out any wrinkles. This method is much less likely to leave water spots or iron impressions than a home steamer or iron. Most wrinkles do fall out within 24-48 hours but it is worthwhile speaking with the dress designer regarding recommended wrinkle removal procedures.